I am considering joining a new gym closer to my home. The gym markets itself as a friendly place for people who simply wish to get into shape, unlike other gyms where overzealous muscle-heads harass, bully and judge them. In my twenty years at various gyms, I have never witnessed the scenario this gym claims is such a problem. As a matter of fact, working out among serious bodybuilders has proven beneficial. At home, my max bench press was my 110 pound set of weights. Thus, I thought that was the most I could safely bench press. Upon joining a gym, I saw a guy half my size pressing far more which opened my eyes to my potential. Working out where professionals were shooting for the moon helped me to at least land among the stars. The new gym near my home brilliantly created an enemy and a crisis which does not exist to attract clients. My fellow Americans, this is the evil modus operandi of our President Obama. To gain public support for him breaking the law, ignoring the Constitution and sidestepping Congress at will, Obama insidiously manufactures a real or nonexistent crisis which he claims poses an immediate danger. He then blames a nonexistent enemy such as obstructive Republicans, Congress and conservatives as the reason he must act unilaterally for the good of the people. This tactic routinely used by Obama is called creating a straw-man; a fallacy, a sham, a distortion, an exaggeration, a lie. Obama's most recent use of the straw-man tactic to con the American people is his attempt to make Congress the bad guys in the fiasco at our border. Obama sent the message to parents in non-contiguous countries that if they get their kids to America they can stay. Consequently, illegal children are invading America by the thousands, 90,000 expected by September 30th. 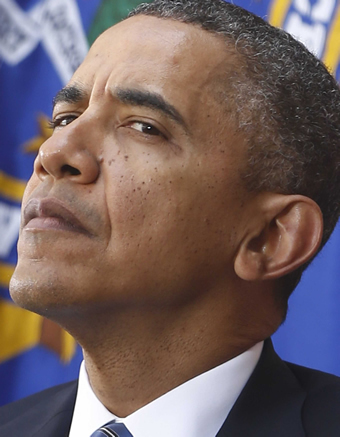 Making Congress the villains in the border mess opens the door for Obama to ride in on his white horse to save the day enacting amnesty by executive order. He is confident that the MSM will play along with him once again shaming America. Another Obama Administration straw-man is its absurd “Republican War on Women”. Talk about creating an enemy which does not exist, Democrats are calling the Supreme Court ruling in favor of Hobby Lobby, “gender bigotry”. What the heck are they talking about. The court simply ruled that the government can not force Hobby Lobby to pay for abortion drugs against their religious faith. Now get this folks. Even before the Supreme Court ruling, Hobby Lobby provides 16 of the 20 contraceptives mandated in Obamacare. Hobby Lobby only refused to pay for the 4 that kill babies. Do you see the Obama Administration spin, the distortion, the attempt to sham, the lie? There is a real war on women and minorities spewing out of the Democratic Party which abuses and exploits women and minorities with impunity. Here is one example of many. Republican president George W. Bush made Condoleezza Rice the most powerful black woman in America and possibly the world as Secretary of State. Guess who was out there calling Secretary Rice an Aunt Jemima, a house n*****, a traitor to her race and relentlessly tried to destroy her simply for being a black conservative? The answer is the Democratic Party. An Obama and MSM supported straw-man that I find particularly deplorable and evil is his divisive slander of millions of Americans in the Tea Party. Think about that folks. The first black president exploits his race to demonize and shame Americans into submitting to his fundamental transformation of America. Decent folks who simply love their country have been successfully branded “racist domestic terrorists” in the minds of many. Past Obama straw-men include banks, the auto industry, insurance companies, small business owners, corporations, the rich and doctors. What American industry, institution or group will Obama declare is public enemy number one? What will be the next crisis Obama accuses them of creating, causing him to usurp unlawful authority to fix? The new gym near my home brilliantly created an enemy and a crisis which does not exist to attract clients. My fellow Americans, this is the evil modus operandi of our President Obama.